Tigertek Morphe is a new single coil RDA with convenient Spring-Post design for easy coil installation. It gives you opportunity to enjoy vaping with no spending to long time on building. 4 colors available. The Morphe RDA is a new 24.5 mm single coil dripper by Tigertek company. The innovative spring-post design makes coil installation process very fast and efficient. Moprhe RDA features an adjustable side airflow, which can become a bottom side airflow if you install the coil a bit higher. RDA has cool look and wide bore 810 drip tip on top. By installing a BF(Bottom Feeding) pin, you can use it on the squonk mods too. 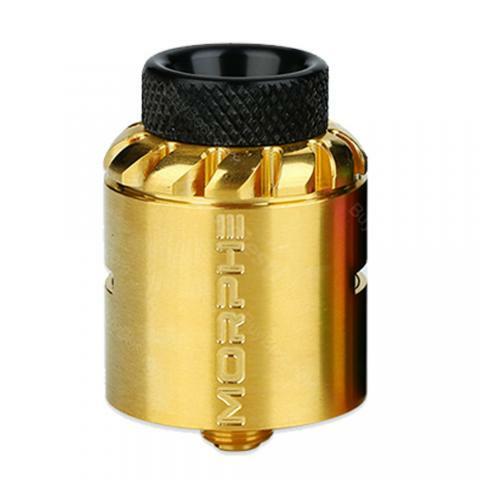 Morphe RDA is an excellent choice for single coil RDA fans. 4 colors are available. It came with a BF pin, I can use it with my squonk mod as well. Very easy building and good quality. I love the morphe rda.It matches both of my mods perfectly. Love my new Morphe RDA. Tigertek Morphe looks cool and working perfectly with mo mod.